Robertson played for Houston and Cleveland in his short career. The Houston Astros/Colt .45′s have had quite a few players die young in their short history. Everyone remembers Don Wilson who threw two no-hitters, and Jim Umbricht who died of malignant melanoma and had his number retired. But other Astros who went before turning 40 include Darryl Kile, Johnny Weekly, Walt Bond, Brian Powell, and Ron Willis at least. I think that’s the most of any MLB franchise in the last 50 years, including the jinxed Angels. RIP Jeriome Robertson. Former major league pitcher Jeriome Robertson, whose 15 wins led all rookies in 2003, has died. He was 33. Robertson was killed Saturday when he lost control of his motorcycle and crashed, the California Highway Patrol said. The left-hander went 15-9 with a 5.10 ERA for Houston in his one big year and topped the team in victories. Robertson was traded to Cleveland before the next season after the Astros signed free agents Roger Clemens and Andy Pettitte. Robertson’s last game in the majors came in July 2004 — he hit Magglio Ordonez with his final pitch and was ejected. He later played in the minors for the Mets and Reds, and finished in 2007 in the Mexican and independent leagues. Astros star Lance Berkman recalled Robertson’s success. “When you play with someone a year, you remember them. It’s certainly a tragedy and what more can you say? It’s a bad deal,” Berkman said before Tuesday night’s game against Washington. “He won 15 games for us. That’s what I remember about him that year. He was solid every time out. He made a big step forward in his development. Then we traded him and really he kind of dropped off the face of the earth,” he said. 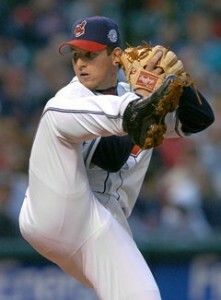 Robertson pitched in only eight more games in the majors after getting dealt to Cleveland. He finished with a career record of 16-12 with a 5.71 ERA.